New Short Story by Me at Uno Kudo!!! Very happy to have my short story "Reunion Tour" in the latest, greatest fourth edition of Uno Kudo. Mine will be at my door by Christmas. So could yours. Just received my copy of Issue Six of the Farallon Review, which includes my short story "Tree Limb Chair" among seven other tales by the likes of Mary Volmer, John Gifford, Julie Woodside, Joey Garcia, Tigh Rickman, Dominic Foser, and Elena Mauli Shapiro. The issue is available by mail, at readings, special events, and the Avid Reader in Sacramento. See their website for details. If you take the plunge and regret it, I'll eat a bowl of bass guitar picks. My latest attempt to make you chuckle popped up this past week at Foundling Review. It's a short one called This Voice, and it's a favorite of mine to break out at readings. Two Readings in Three Days! Yep. That's how good I got it. First was a whole crew of Curbside Splendor readers at the new Reading Frenzy in Alberta. I came for Brian Costello, whose rock-ish novel Losing in Gainesville I plan to review, but I was blown away by the quality work of all four readers. Second, I made it to Powell's on a rainy Friday night to hear the inimitable Karen Karbo read from the Hawthorne Books reissue of her 1991 slapstick novel The Diamond Lane. The section Karen read felt like it was written yesterday. Wanna read how funny lit fic is supposed to go? Look no further. So, I'm set with two new, thick titles just in time for the rain. My One-Day Self-Pub Seminar Runs in Less than Two Weeks! If you plan on self-publishing in the near future, you will not regret taking my one-day seminar, where I show you the path through the murky waters of contemporary self-publishing to the Land of Book Success and Fulfillment. And who doesn't want to go there? It takes one Sunday at The Attic, November 2nd, from 10 AM to 4 PM. You’ve written a book, and you’re wondering which mode of publishing—self- or traditional—is most likely to lead to a career in writing. Good. You should be wondering. It’s a new century, and new ways exist to get your book to buyers that can be at least as rewarding as the traditional publishing model. Despite all recent innovation, the easiest road to the land of a book publishing career still passes through the traditional publishing house. Here’s the way it works: either you or your agent finds an editor at a publishing house who wants to publish your book, and the house (usually) writes you a check for it. That check is called an advance, and it isn’t free; you get it up front against future royalties of your book. You don’t receive any more money from the publisher until your book sells so many copies—when it “earns out” your advance—and then you start to bank your dollar or whatever in royalties for each book sold. While not without its drawbacks, this is the easiest path to financial success for the writer because you collect money months or years before your book comes out. Think about that. You get paid before anyone in the book-buying market even knows you’ve written a book, much less decides they want it. It’s now in your publisher’s best interest to do a great job editing, proofreading, designing a cover, printing and marketing your book, or it might not see that advance money again. The risk is all theirs. Moreover, your publishing company could do a great job publishing and marketing your book and, for whatever reason, people still don’t buy it. In that instance, the company absorbs the loss while you keep the advance money. Finally, if your book sells well, you still have a chance to earn royalties well beyond the advance. These backend royalties are how many of the writers in the world make their living. Welcome to the big leagues. And if I were writing this piece twenty years ago, that would pretty much be the end of the story. But in 2014, an argument can be made that self-publishing your book is a legitimate business model as well. What’s changed? The biggest advent to the business of self-publishing is the proliferation of ebooks and ebook devices. Writers now have a way to get their books distributed to millions of readers all by themselves. The self-publisher of a couple decades ago falls to her knees and weeps at the mention of entities like Kindle Direct Publishing and Smashwords. From the time your book is finished, you can have it available to a large buying audience in less than 24 hours. For free. Unprecedented. Second only to ebooks, the advent in the last decade or so of print-on-demand publishing has also changed the game for the self-publisher. As late as the mid-1990s, if a self-publisher wanted to create an affordable edition of his work, he had to call a book printer, who usually had to print a thousand copies or more to bring the book’s price-per-unit to a reasonable level. This meant the self-publisher had to pay at least $3,000 to the printer before anyone could buy a single book. Then he had to find a place to store them, which often amounted to a home stuffed with boxes of books. A common scenario involved the self-publisher never being able to sell all of them. Can you imagine being forced to choose between space in your garage or several hundred copies of your book? Some gave their extras away to libraries for tax write-offs. Others, after years of futility, drove them to the dump. With print-on-demand technology, you can publish an actual book, and the old issues of high cost and storage space need never darken your (garage) door. Print-on-demand companies like Lightning Source and Createspace charge as little as $25 to have your book in their database, where it’s ready to be printed and distributed. Then they charge a reasonable fee per book (about $3-10, depending on many variables) to print them. In other words, self-publishers don’t have to buy 1,000 copies of their title to have a few copies on hand, or to have it available to customers at places like Amazon and Powells.com. You can buy just one copy if you want. Print-on-demand companies are happy to oblige. Because of all this new technology, self-publishing is at least in the ballgame now. And there’s one more issue I haven’t yet mentioned. Take, for example, the case of Hugh Howey. Howey self-published his post-apocalyptic novel Wool as an ebook in 2012. Things went very well for Howey and Wool, which sold a half-million copies in electronic form. When Simon and Schuster approached Howey, wanting to purchase the rights to Wool, Howey was all for it—until he heard the company wanted his ebook rights too. “I had made seven figures [selling Wool as an ebook] … so it was easy to walk away,” he said. Eventually, he sold just the book-book rights to Simon and Schuster, and I saw Wool prominently displayed at my local bookstore this past Christmas season. Or the case of Jenny McGuire. McGuire self-published her new adult romance Beautiful Disaster in 2011, which went to number one on the New York Times bestseller list. The book was later sold to Atria Books, with the movie rights sold to Warner Bros.
Or the case of Amanda Hocking. Hocking made millions in her first year self-publishing her young adult paranormal romance and urban fantasy novels as ebooks. She then went on to sign a $2.2 million contract with St. Martins Press. The successfully self-published author who later decides to go the traditional route has more leverage than those writers with nothing but a manuscript and their good looks. She can bag both the writer’s and publisher’s share while self-publishing, then use that success to get a far more favorable deal with a major. Win-win. To be clear, these mega-success stories represent only the smallest fraction of those who self-publish. The vast majority wind up with less remarkable sales (that’s me), or none at all. Still, no one but the willfully blind could argue this phenomenon doesn’t exist. Perhaps more relevant than hitting pay dirt, because of ebooks and print-on-demand technology, many writers now make modest livings self-publishing their works. This list includes Meilin Miranda, who self-publishes Victorianesque fantasy and science fiction; Shanna Germain, who has one self-published book that yielded $32k through a Kickstarter campaign; or Aaron Shepherd, whose how-to books about self-publishing are staples of the genre. I didn’t have to go to the edges of the earth to find these folks. They’re friends, or friends of friends, or people I’ve run across when searching for practical help with self-publishing. My guess is none of them will be sailing to Bora Bora anytime soon on their self-publishing earnings, but each manages at least to sustain themselves through the model. How many more of them are out there? Hundreds? Thousands? While the get-rich stories get more attention, what the ascendance of self-publishing technology in 2014 really means for the aspiring writer is she can realistically hope for a new, freer path to a writing career. If you can write a book people want to read and market it well, you may not hit pay-dirt, but you just might get a life. Ready to self-pub? Take my one-day seminar in early November at The Attic. It's a short film chronicling the big night in May 2013 when Stuck the Movie made its premier. At about the two-minute mark, you even get to see me try to make sense of the "Why'd you end it that way?" question. Short Fiction Forthcoming by Me! I spent the first decade of my writing life focused entirely on long fiction, but I was originally drawn to fiction by the short story. A few years ago, I started dedicating time to this genre, and it's now starting to yield results. I'll keep you posted on when and how you can read these stories, but know they're coming. The new novels added this year are by Stacey D'Erasmo and Rob Yardumian. I also reread Great Jones Street after a couple of people claimed it deserved a higher slot, but I can't agree. GJS is a great novel that for me lacks some heart. You can now get Badge for $7.50 at my website. Even with shipping, that's still below the list price at Amazon. If you haven't taken the Badge plunge yet, now's the time. These thirteen people are fawning over it. And probably thirteen more somewhere else. By the third week, I’m in hell. I’m managing a Kickstarter campaign to fund the self-publication of my third novel Badge. I need to accrue $6,000 in donations in a total of 25 days or I get nothing. For me this means hitting up Facebook friends, the 400 or so people on my email list, friends and family, telling them about my book and the campaign. By this third week, things have stalled. The tally is just above $3,000—over half way there—but it’s been slow for over a week. I’ve already hit my contacts hard. I have no idea what else to do. When it became clear my third novel Badge wasn’t going to get publishing traditionally, I decided to crowd source its self-publication. I was familiar with Kickstarter. I’d helped promote the Kickstarter campaign to fund the film version of my first novel Stuck Outside of Phoenix, which met its goal, and the film is now in the can awaiting distribution. I didn’t care much for the roller coaster process of crowd sourcing, but I liked it a lot better than not having a film version of my first novel in the can. I could’ve just published Badge on the cheap—say, as an ebook with no money for promotion—but Badge was my best book yet, the culmination of seventeen years of novel writing. To publish it solely as an ebook—or to watch myself go into debt with it as I had with my first two self-published novels—wasn’t what I had in mind. Three novels into my writing career, I felt the least I could ask for was not to lose money on publishing my fiction. I wrote up a business plan—proofreading, publishing, printing and review copy submissions of Badge, plus a five-city West Coast tour. The bottom line came to about $5,000. It wasn’t an ideal plan; I considered it the minimum of what I wanted for Badge. Figuring I was probably underestimating expenses, I decided I needed $6,000 for the project. At the time I set up the campaign, there were a couple of main companies you could go through to crowd source. Kickstarter was one. A Kickstarter campaign’s most distinguishing feature is that the artist has to reach or exceed her goal to get any money. If your goal is $10,000 and you raise $9,999, you get $0. Indiegogo, the second major way to crowd source, allows you to choose whether your campaign is all-or-nothing or not. If the example above were earned during a non-all-or-nothing Indiegogo campaign, the artist would keep $9,999 (minus fees). On the surface, getting to keep whatever you raise looks like a huge asset for the artist. Can you imagine doing all that pleading for nothing? But that’s not the whole story. Something about all-or-nothing campaigns are more exciting than ones that merely have a suggested goal. The drama of $10k-or-the-highway is real, and people tune in, check to see how you’re doing, root for you, share your campaign with friends and, of course, donate. It must be harder to keep people interested over the course of a weeks-long campaign if they aren’t wondering if you’re going to make it. Donors want to win just like you do. What I love about Indiegogo is its independent status. Kickstarter is deeply entrenched with Amazon, which handles all of the company’s money transactions, and Amazon gets a percentage of every dollar raised on Kickstarter. If you’ve followed the publishing industry for the last couple of decades, you know Amazon’s goal is to pretty much destroy independent bookstores. I find neighborhood indies vital to my own sanity, so I go out of my way not to support Amazon. Still, I went with Kickstarter for Badge for one reason: many of the folks in my social circle gave to the Stuck the Movie Kickstarter campaign, and I didn’t want to scare them away with a crowd sourcing method that was new to them. In the end, I couldn’t afford to be too precious about not giving one thin dime to Amazon. If I wanted to publish Badge well, I needed this thing to work. As I prepared the Badge page at Kickstarter, I had to pick a block of time for the campaign. Kickstarter recommends one month. I remember from the Stuck the Movie fundraising that a month seemed too long, so I opted for 25 days. That was four full work weeks, which I think is a healthy arc for the story of your campaign to build momentum. From my experience, Kickstarter campaigns follow a certain trajectory. The first few days bring lots of excitement and donations. By the second week, the campaign feels like old news, and there are few donations. The third week often rekindles energy and donations, and the fourth week brings great drama and (hopefully) pushes you over the line. Patrons seem not to want to end these things before the clock ticks down or they’ll kill the arc. I also think they want to wait to see if you’re going to be successful before they donate. It’s a weird synergy. You need people to donate to encourage others to donate, but no one seems to want to donate if there aren’t already donations. It becomes a chicken-or-egg scenario. During the Stuck the Movie campaign, I got excited when donations came during the days when nothing else was going on, or when larger sums were donated that clearly encouraged others to give at more modest levels. The former kept me hopeful, the latter helped create a winning vibe. Everyone involved needs a jolt here and there. I started my Badge campaign on May 19th, let everyone in my social network (Facebook and Twitter) know about it, and sent an email to my email list. To complicate things, my wife and I don’t have the Internet at home, so much of this online work was done at the library, or in my truck in the McDonald’s parking lot up the street, taking advantage of their wayward wifi signal. Not the way I’d choose to spend my time, but it was working. A couple of large donations got things rolling, and I was thrilled to make it to $2,500 by the end of the first week. During the second week, I kept it up on Facebook and Twitter, but incoming donations were much slower going. I had to post like crazy to eke my total above $3,000 by week’s end. Halfway there at the halfway point wasn’t bad, but the constant marketing had me doubting myself. I remembered a Faulkner story called “Spotted Horses” in which the unsavory Flem Snopes comes to town with a batch of wild horses. Snopes announces they’re for sale, and the townspeople laugh. No one would buy such a worthless bunch of animals. Snopes is undaunted, sets up shop in the middle of town, creates a temporary corral. Eventually, in a skillful tap dance that would make any used car salesman proud, Snopes sells every last horse, some to the same townspeople who’d laughed at him. The theme is clear: Hang around long enough, present yourself with enough authority, and eventually you’ll sell. My weeks-long Internet barrage had me feeling vaguely Snopes-ish, but I reminded myself I wasn’t selling something worthless. I was selling a novel that took seven years to write, and it wasn’t going to see the light of day unless people donated. If it didn’t make the goal, I wouldn’t waste any more of my or their time, but I wasn’t going to get sheepish now. I count on week three to reinvigorate my campaign, but the trickle continues. At this point, I’m desperate. I email my largest donors, ask them politely what I could do to entice them into a higher bracket. I even create a new $1,000 donation level with a reward I hadn’t thought of before. When the third week comes to a close, I’m at $3,700. One week and $2,300 to go. I regret tacking on that extra grand to my goal in the beginning. Still, I accrued $2,500 in the first week. There’s nothing to do but keep slogging. More Facebook posts, more emails, more Tweets early in the last week bring some curious folks out of the woodwork, and I wind up at $4,500 with one work day to go. The only answer seems to be to hang out in the McDonald’s parking lot all day, making sure folks understand the end is nigh. I’m betting the whole McMuffin on the drama factor making people feel generous at the end. At this point, it’s my only play. That afternoon, a big donor puts me above $5,000, and I feel a weight lifted. I announce all over Facebook I’m within $1,000 and that there are only a handful hours to go. Then I get a $125 donation, then $75, then $50. I’m over $5,500 with two hours to go. Five hundred lousy bucks! I post, I tweet, I email. The last hour brings a flurry of smaller donations, and with mere seconds to go I wind up at $6,031. By the skin of my teeth, Badge will happen the way I want it to happen. The campaign was pretty much all I thought about for 25 days. I was always online, checking my donation status, posting updates, sending emails, thanking patrons and constantly wondering if that was enough. And it was worth it. It’s hard to overestimate how much having money to start a publication project means to me. I’ve self-published two novels over the past decade, and I have yet to profit from either. In the end, there was a minimum amount of dignity I wanted for my work on Badge, and that dignity cost $6,000. I’m grateful to all 87 of my Kickstarter donors who helped get me there. Crowd sourcing is a relatively new tool that allows self-publishers more opportunity to make a living as writers, or at least not to lose money on their projects. That might not sound like much, but for those of us who need to do this, it beats the hell out of the alternative. Stuck Outside of Phoenix the Movie "Broker"
The "deal signed" for Stuck the Movie wasn't the distribution deal we all hope for but one with a "broker, who's going to shop [Stuck] to a ton of distro companies." So, not the exciting news I thought, but perhaps one step closer to the finish line. Hang in there with me, folks. It's still coming. I hear Facebook mutterings that Nico Holthaus has "just signed a deal in LA" for Stuck Outside of Phoenix the Movie. I hope this means we're on the path to all of you getting to see it very soon. Vague, I know, but I'm excited. I'll get more info this week and update you next. Watch the trailer for Stuck Outside of Phoenix the Movie. Who's Ready to See Their Book In Print? Big congrats to Rebecca Pillsbury, who took my one-day self-publishing seminar last November at the Attic, and now her memoir, Finding Ecstacy, is available to everyone. See how that works? Are you ready to get your book out there? Sign up for my Attic seminar this November, and you'll be ready to go pro in 2015. My Review of Bob Mould's Autobiography up at HTMLGIANT!!! I finally decided to read the Bob Mould autobiography that came out a few years ago, and I was so moved I had to write a review of it, which HTMLGIANT published this week. It's my take on Bob's take of Husker's demise, and I hope you like it. Take my one-day intensive on self-publishing at The Attic, and I'll teach you how to publish your book in a way that not one thin dime goes to a shareholder. I Need One More Badge Amazon Review!!! I'm trying to get this emarketing company called Bookbub to partner with Badge, but it's widely believed (meaning my friend Craig Machen told me) it's necessary for your book to have at least ten Amazon reviews before Bookbub will consider it. For those of you who have reviewed Badge at Amazon already, thanks so much. Getting to hear your thoughts has been one of the highlights of this whole experience for me. Anyone who's read Badge but hasn't yet reviewed it at Amazon, would you mind dropping by and offering your two cents? It just takes a second, and you do not have to be Shakespeare to do it. Write what you liked and didn't about Badge, hit publish, and you're good to go. And I'll be eternally grateful. I've been picking my way through a few great rock titles this summer, and I'll be reviewing them all in the coming weeks. The first review, of See a Little Light: The Trail of Rage and Melody by Bob Mould, will see the light at HTMLGIANT in July. I was a big Husker fan as a youngster and had plenty to say about Mould's take on the band. I also just finished the review of the rock novel Wonderland by Stacey D'Erasmo, and I hope to have a landing place for it soon. I'm currently reading another rock novel, The Sound of Songs Across the Water by Rob Yardumian, and will get to work on a review of it next week. Then I can finally get into Midnight, Jesus & Me, a memoir by fellow rock freak JM Blaine. I'll write up a review for it in August. Finally, I'll be updating my Top 20 Rock Novels of All Time in the fall. This update becomes necessary after reading the two rock novels above, and I may re-read one that made the list last year but that many felt I gave short shrift. Look for the updated list in September. You can wait for my take on these books, but it would be great if you read and wanted to discuss them as well. You can really gone wrong with any of them. I've lately been working on a few pieces about my favorite bands and music artists, and the first popped up this week at Word Riot. It involves Morrissey, chewing tobacco, and my bad post-Refreshments employment record. Give it one paragraph. Dan Berne tagged me in a writing process blog tour. I love Dan's debut novel, The Gods of Second Chances, which had me in knots for a week. I'm trying to imagine a more perfect summer read and am coming up empty. Go get it. My main project is my fourth novel, One Star, and it's in something like its second draft. I've been working on it for a year or two, and it will be at least another two before it will be ready for your eyes. I'm also finishing the screenplay version of my second novel Ghost Notes, and many other shorter things. Rock novels seem to be attempted by two types. The first are rock fans. The second are rock musicians. The former group tends to write better ones, as the latter group I think tends to think novel writing is easier than it is and gives up at some point. My goal is to be both types of rock novelist at once, which is ideally what sets my work apart. The first time I read something that truly affected me was a short story by Katherine Anne Porter in a college English class. I can't remember the title, and I haven't been able to find it since. It was an extremely simple line--something about a female character jumping over a stream. I couldn't believe how deeply it struck me. My first thought was, "I didn't even know jumping over a stream made me feel that way, but now that I've read this description of it, I realize it totally does." It seemed a profound way of communicating from Katherine to me. I've pretty much spent the last three decades looking for more novels and stories I relate to as deeply, and trying to relay my own experiences in the same way as Ms. Porter. I usually start a novel with one surface idea. For my latest, Badge, it was a comment by my guitarist friend Bret Hartley that went something like: "I have to play this cover gig tonight when I'd rather be in my basement learning Jeff Beck licks." It sounded like the entire plight of the rock and roll sideman in one sentence. I started writing the novel that would become Badge the next morning. I write all my novels the same way: 500 words a day--no more no less--and I do that every morning until I have a completed first draft. Then I start at the beginning again. I'm kind of monkish about it. I don't remember the last morning I skipped my 500 words. 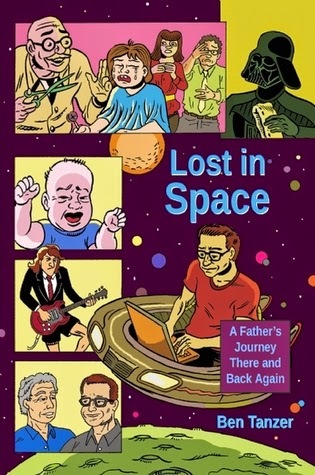 Everyone needs to check out Lost in Space by Ben Tanzer, which will break your heart whether you're a parent or not. I saw Ben read one of these stories in Seattle this past year and almost teared up. I said almost. Consider yourself Tanzered. 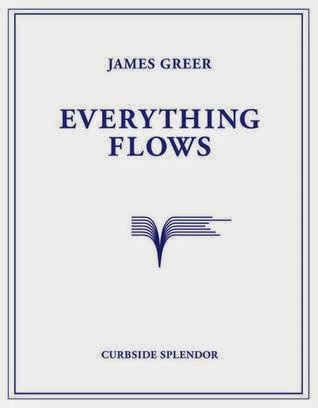 Also, James Greer's Everything Flows is unlike anything else you'll read. Surreal, with many sublime moments, and REM references to boot. Try it and tell me I'm wrong. Take my One-Day Self-Publishing Seminar this Month at the Attic!!! In six hours on a Sunday, I will cram your head full of my decade of self-publishing knowledge, and you'll like it. If you're thinking about self-pubbing in 2014, you don't want to miss this. Space still available. Sign up now at the Attic. On the Badge front, you'll want to take a look at this exhaustive review by Rob McNelly of all three of my novels. I respond at length at the end. Topics include what's fiction and what's non-, the endings of all three books, and much more. Read it here. I could not be more thrilled to have gotten this chance. Thanks for helping me make it a reality, folks. What's next for Badge? Time for new rock lit readers, and that means searching every nook and cranny to find them. Book deals? Yes. Ebook promotion? Yes. More readings? Yes. Bugging you later? Probably. I'm working on all of it. But this week I'm going to take a breath and enjoy what we've accomplished together. I hope you're loving Badge, and if you don't have a copy yet, I know where you can get one. Badge SF and LA Events This Week!!! Badge Tour takes me to two California events this week! My Los Angeles shindig will go down and Stories in Echo Park on Wednesday and will include a brief reading from Badge, along with readings by two other rock-tinged novelists Duke Haney and Rob Roberge. If you followed my blogging about rock novels in 2013, you know how fond I am of both these writers. 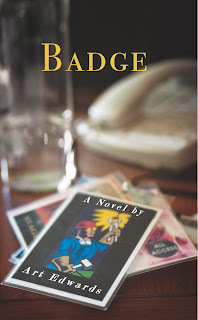 My San Francisco soiree happens at Alley Cat Books this Thursday and will also include a brief reading from Badge, along with readings by two cool Bay Area writers Meg Pokrass and Grant Faulkner. So pleased to be heading back to my old stomping grounds and reading with these folks. Free admission, of course. Q & As to follow. These are my only CA appearances in 2014. Come out and see me! My Phoenix Event this Wednesday Includes Special Refreshments Element!!! Any Art Edwards book tour would not be complete without a giant dollop of Refreshments nostalgia, and that's just what you'll get if you come to my event this Wednesday, 3/12, at 7:30 PM at Phoenix's FilmBar. You'll of course get a good dose of my latest novel Badge, plus a PowerPoint Presentation to set the scene. But you'll also get a short reading from my work-in-progress, a memoir about--yep--my time in the Refreshments. Its working title is Eighteen Ways to Destroy Your Rock Band: My Life in the Refreshments, and I'll read a bit from an early part of the story when the stars align one night in the Sonoran Desert and three drunk guys from Tempe wander into their destiny. Refreshments fans, you are not going to want to miss this. The admission is free, and there will be drinks. Who's on board? Say you're coming at the Facebook event page. New Badge Podcast, New Piece on Rock Novels, and here comes AZ, LA and SF!!! The fun just doesn't stop here at Badge Central. First up, here's a podcast of me chatting for a half hour with Ben Tanzer, whose VIDA reading at AWP was so good I almost cried. Ben and I chat Badge, The Refreshments, writing and Novel Four. Also, here's a piece I wrote about my problems with the term "rock novel" that The Nervous Breakdown published on Sunday. Help us find a replacement for this woefully stupid monicker! Finally, this is my last week at home before I head to AZ and CA for Badge Tour 2014. Check out the tour's dates and make sure you hit one. Badge is Now Available for Your Kindle Devices, plus Upcoming Portland Badge Event!!! It's been a great week here at Badge central. I'm getting lots of comments from people digging Badge, and it really feels wonderful. I work on these things for so long, it's almost surprising when someone comments on it. For a second I'm like, "How do they know that?" Anyway, love the comments. Please keep them coming, and feel free to review Badge at GoodReads. That's very helpful to me at this stage. For you ebook fanatics, I have great news. Badge is now available for your Kindle devices. That's a week before its publication date! Get yours now! It's on Wednesday, Feb. 5th, at everyone's favorite NE Portland bookstore Broadway Books. I'll be taking the podium with two really amazing Portland writers/people: Monica Drake, whose The Stud Book is a must-read for those who love our fair city; and Mark Russell, whose God is Disappointed in You might be the most important book you read this year. And the best part is, all writers will have a multimedia element to their reading/presentation! This will not be boring. Badge aside, it will be kind of a special day for me. It's been over a decade since my last reading at a Portland bookstore. Here's a photo of that day. 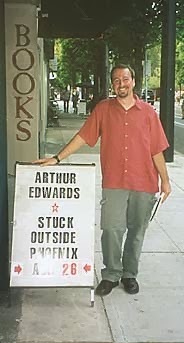 Were any of you at this reading at 23rd Avenue Books in August 2003? There were 12 of you (yes, I counted). So, plan on Wednesday 2/5 at Broadway Books at 7 PM. (Free!) I'll be the one with the perma-grin. New Essay On Self-Publishing up at Word Riot! An essay of mine on self-publishing just went live a Word Riot. Read along as I start to get cocky about this whole thing. Also, Badge's book trailer went live last week. Moreover, you now can buy Badge from my website during its presale. Finally, if you do buy Badge during its presale, I'll email you the mp3 of Badge's theme song "Calypso" as a bonus! Badge Book Trailer/Badge Presales Start Today!/"Calypso"
Today is a special day in Badgeland. First, Badge's book trailer just went live. You can watch it here. The book trailer offers your first chance to hear the theme song of Badge, which is called "Calypso." "Calypso" also appears in Badge as a song written by Betty of No Fun Intended, so it's a fun thing to get to hear. Also, in celebration of bringing you the Badge book trailer and "Calypso" on the same day, let's start Badge pre-sales at my website early. Like, right now! To be clear, these are pre-sales, not pre-orders. The difference is, once you buy Badge from me, it will go out in the mail to you tomorrow and not on its release date of Feb. 4th. That's at least two weeks before it goes on sale at Amazon. Come and get it! And how about we sweeten the deal? If you buy Badge from my website during this pre-sale, I'll email you the mp3 of "Calypso" as a bonus! So, here's the Badge book trailer, which features "Calypso," and you can have "Calypso" emailed to you if you buy Badge during it's pre-sale period (now until Feb. 3) from my website. How's that for a week! It only took seven years to get here! Last but not least, I'd like to thank the special people who made "Calypso" happen. 4) And Dave Lindenbaum for allowing me to record bass for the track at his studio instead of me having to book a flight to Atlanta. Every one of these folks worked well below what they're worth to bring "Calypso" to you, so if you like the song, don't hesitate to shoot them a Facebook message thanking them. Or read an excerpt from Badge. One of my favorite parts of putting together the promotion for Badge has been writing essays for the Internet. I've finished eight or ten of them ready, and I'm working on another ten or twelve now. These essays deal with my favorite subjects: writing (esp. rock fiction), publishing (esp. self-publishing) and music (esp. the music of my youth). So you can expect one or two short Internet pieces from me each month in 2014. The first popped up over the weekend at The Nervous Breakdown. It's called Thirteenth Note and explains the name of Kel's and my new publishing company, and why rock fiction characters don't have to be David Lee Roths. The second is at writer extraordinaire Nick Belarde's website, and it deals with a recent visit back to the bookstore of my literary youth, Changing Hands in Tempe, Arizona. Or is it the bookstore of my youth? Most all of my Badge-related events are booked through March, and they involve stops in Portland, Seattle, Phoenix, Los Angeles and San Francisco. Final details are still coming together, but know each event will be special in its way. I can't wait for this part. Finally, Badge pre-sales start in less than two weeks at my website! If you missed the Kickstarter fundraiser, this will be your first chance to get your copy of Badge, which goes on sale worldwide on Feb. 4th. Read the blurb of Badge. Or read an excerpt of Badge.